Dial Before You Dig WA in collaboration with CAPE, ATCO, Water Corporation, Western Power and KD.1 Pty Ltd are pleased to be launching a series of videos around the importance of working with above and underground assets. Lodging a Dial Before You Dig enquiry can minimise the risk of damaging asset owner’s infrastructure and these novel and fun videos explain the fundamentals required in protecting Australia’s assets. There are three videos featuring Doug the Wombat and his friends and the first video illustrates the importance of lodging a Dial Before You Dig enquiry. The second video introduces the 5th P – Prepare. This includes reviewing the utility plans and contacting the asset owner if further assistance is required. Look for onsite asset and infrastructure clues such as lids, marker posts and meters. The final video featuring Doug the Wombat and his friends explain the importance of Potholing and is the third P on the list of the must do 5Ps of safe excavation. Additional presenters can also be requested from the key asset owning Dial Before You Dig Members such as gas, telecommunications, power and water. 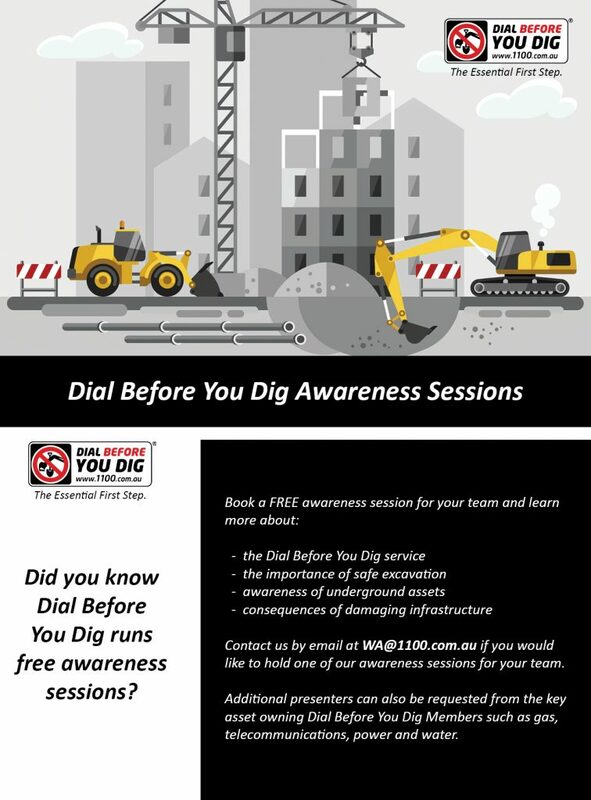 Dial Before You Dig WA in conjunction with CCF WA have created a two day awareness training course: RIICCM202D Identify, Locate and Protect Underground Utilities Training Course. The course is designed to form an understanding of locating and protecting infrastructure assets and networks. Day 1 forms the requirement of Units of Competency for RIICCM202D Identify, Locate and Protect Underground Utilities Training for Day 2. Day 2 forms the requirement of Units of Competency for nationally accredited qualifications such as Certificate III in Trenchless Technology, Certificate III in Civil Construction and Certificate III in Civil Construction Plant Operations. The course is subsidised by CCF WA for its members. For further details, click here . For bookings please contact CCF WA on (08) 9414 1486 or ccfwa@ccfwa.com.au.